During my backpacking trip through Africa, there were so many moments when I though to myself, I’ve gotta remember this for the next time I travel. Like most independent travelers headed for developing countries (independent = travelers who aren’t with a group and figure out accommodation and other details as they go), I knew to bring a money belt, invest in a pair of durable shoes and abide by simple food rules: boil it, peel it, cook it or forget it. But I learned a few more tricks along the way, ones you can use for your next travel adventure. Mom shows us how easy it is to use a stand-alone net. 1. Love your mozzie net. 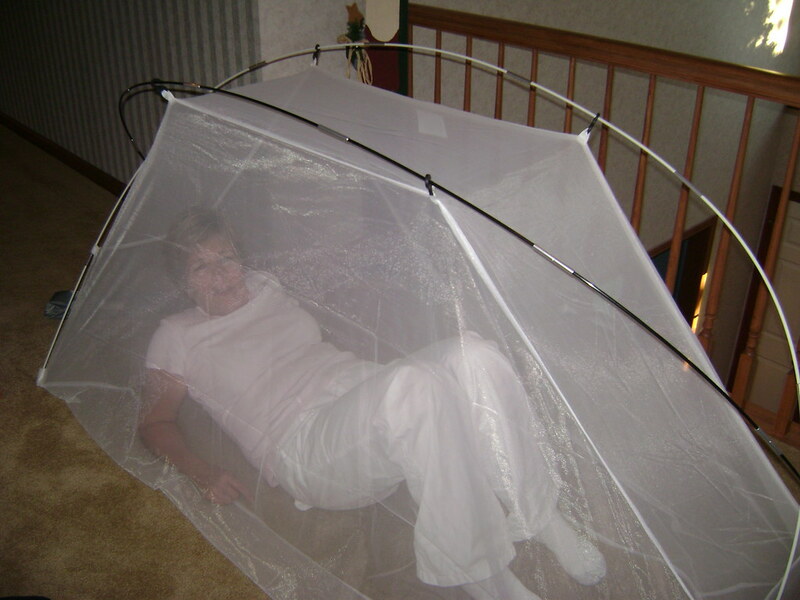 If you need a mosquito net, buy one that includes poles and sets up like a tent. (I use this Skeeter Defeater from Long Road Travel Supplies.) Hangable nets are useless when there&apos;s nowhere to hang them. 2. Learn to Skype. Skype, a free service that allows you to make calls over the Internet, is the cheapest way to call home. The drawback: for it to work well, you need a solid Internet connection, which can be hard to find in some developing countries. If you plan to Skype often, you may want to bring your own headset. 3. Be your own office assistant. Create sticky labels with addresses of anyone who deserves to get a postcard. You won&apos;t have to carry an address book, and you&apos;ll know you sent all required postcards when the labels are gone. 4. Buy visas along the way. It takes a little planning, but buying a visa in the country adjacent to where you&apos;re going is usually cheaper than buying it from home and requires less paperwork. Just make sure there&apos;s an embassy for country #2 in country #1, lest you get stuck without one. Also remember to ask about multi-country visas, which also can save you money. 5. Cipro for the sicko. Convince your doctor to prescribe several doses of Cipro, or Ciprofloxacin, an antibiotic that treats bacterial infections — pretty much anything that forces you to spend your entire day squatting over the toilet. Since travelers often suffer from stomach bugs in developing countries, it&apos;s smart to have this drug handy. Bring Bacitracin ointment, too, and use it; even small cuts become easily infected when you’re not at home. 6. Make room for music. Ditch something in your pack so you can bring lightweight, portable speakers for your iPod. You&apos;ll use them at hostels, on the beach, everywhere you want to share your music with others. 7. Wear your torch. Bring a headlamp and an extra set of batteries. You&apos;ll use it on dark, unlit streets when the power goes out, in hostel dorm rooms when you want to read late at night and on late-night bush taxi trips. 8. Ask for the cheapest room. When checking into a hotel, ask if there&apos;s a cheaper room. When they show it to you, ask if there&apos;s anything cheaper. Since hotels make more money booking expensive rooms, they&apos;ll sometimes place guests in, say, a double when all the client really needs is a single. Remember to ask whether there&apos;s a dorm, too. 9. Look for books. Ask hostels whether they have a book exchange where you can leave a book you&apos;ve already read and take one left by another traveler. If you&apos;re always on the lookout for book swaps, you&apos;ll never need to carry more than one book at a time. 10. Pack a pillow. No, not the huge, fluffy one you normally sleep with. I&apos;m talking about a small, portable pillow. (I like this Equinox Headrest sold at Eastern Mountain Sports.) The cheaper the accommodation, the less comfortable the pillow, if you get one at all. And let&apos;s face it (pun intended), do you really want to put your head on those hostel pillows anyhow? 11. Seek out alternative power. If you&apos;re bringing electronics that need to be recharged but wonder whether you&apos;ll have electricity, invest in a small solar recharge system. For an iPod, consider bringing an extra battery. Don&apos;t forget that rechargeable batteries, though environmentally friendly, are useless if you&apos;re staying in a mud hut without an outlet. For this reason, I use a digital camera that runs off old-school throw-away batteries. And since it’s difficult to find quality batteries in some places, I carry extras of those, too. 12. Pack as little as possible. Now that I’ve added half a dozen items to your packing list, here’s the hard part: pack light. You&apos;ve heard this a zillion times. You&apos;ve dumped half of what you packed to lighten your load. Now lighten it even more. Can you walk around the block carrying all your stuff, and free a hand to shoo away strange men? Now you&apos;re set to go. What other ideas or advice helps make a trip more enjoyable? Great tips, Alexis. The points about visas were particularly good — I didn’t know anything about multi-country visas. And yes, Cipro is 100 percent important. Though I dicovered in Indonesia that it was sold at 1/100th of the price. I mean, seriously. It was like 6 cents a pill — without a prescription. Not sure, though, if it’s the same in a lot of developing nations. And it’s all about the pillow! I’ve regretted not bringing one more than once. And yet, the lesson never seems to stick. These are awesome tips! I’m hoping my husband and I get to use them soon 🙂 I’ve never been a fan of tour groups. They’re too constricting and “touristy”. It might not make it more enjoyable, but definitely safer and easier. Carry copies of your passport. It would be a huge pain, if you lost the original. Regarding visas, it also pays to check holiday schedules for *both* countries (the one where the embassy is, and the one you want a visa for). And allow a time cushion! I once almost had my passport expire because my carefully researched and choreographed visit to my nearest embassy was foiled when it closed for an official day of mourning (hard to predict those!). Great tips, thanks! I am definitely looking into #5. Do you have advice on vaccines? Best advice is to research online which vaccines are required for the company you want to visit. Then call your primary doctor and ask if they carry those vaccines. You might also check in with a travel clinic, because they’ll have a better idea of what you need than your primary care doctor (if you can’t figure it out yourself online). Start early, because sometimes it takes several doses over a period of months to be properly vaccinated. CDC has some good resources. Querying your memoir: manuscript or proposal?